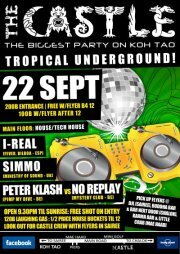 FRIDAY night is all about TROPICAL UNDERGROUND @ The Castle, and it’s a Songkran special so even more of an excuse to party! 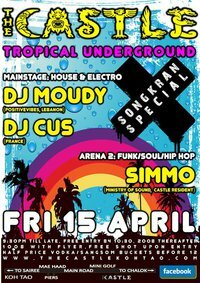 This week we welcome special guest DJ MOUDY and DJ CUS in the House & Electro mainstage, SIMMO will be in the 2nd arena playing funk/soul and hiphop. This season’s parties have been MASSIVE so we’re expecting yet another cracking night. 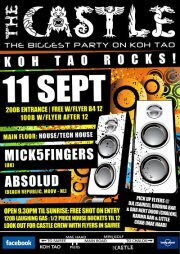 We kick things off at the new early start of 9:30pm, its free entry …before 10:30pm and 200bht thereafter (100bht with a flyer) grab a free shot on entrance! 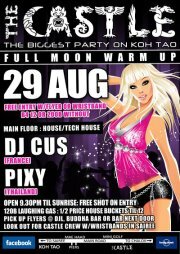 Also.. Don’t forget – Vodka/Sangsom buckets are still half price before midnight so don’t miss out! ♬♬ DJ MOUDY – Moudy’s way behind the decks is all about putting the people in the mood that he’s in, his mood swings varies from Minimal to House to Techno dancefloor killers. Spinning all over Switzerland, Portugal, Malaysia, Thailand, Lebanon & middle-east. 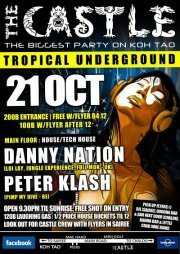 In 2009 he became the 1st Middle-East DJ to play at the Famous Full Moon Parties at Koh-Phangan, Thailand. ♬♬ DJ CUS – His distinctive French jackin’ sound, his love for music and impressive technical ability has been demonstrated in his charismatic, vibrant performances.